Many systems incorporate an inverter/charger, which is a combination of an inverter, battery charger and transfer switch in one. The inverter portion converts DC power from an energy source into AC Power. The battery charger processes incoming AC power into DC power and recharges batteries using a multi-stage process, which helps assure maximum battery life. Some models are also able to automate supplementary power production with automatic generator start and stop capabilities. 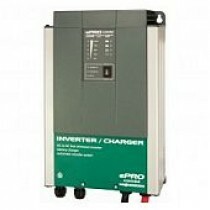 Many Inverter/Chargers now incorporate an automatic transfer switch. This switch senses when outside AC Power is present and transfers the load from the inverter to the source of incoming power (shore or generator). The unit also automatically switches from invert mode to charge mode. What type of batteries should I use in my Inverter/Charger installation? We only recommend using only high-quality deep cycle batteries in Wet, Gel or AGM (Absorbed Glass Matt) technologies to be used with inverter/chargers. Deep-cycle batteries are designed specifically for a deep discharge and a rapid recharge. Wet cell batteries include 6-volt (golf cart) batteries and require some maintenance. Gel cell batteries and AGM batteries are sealed and typically require very little maintenance. Do not use starting batteries for inverter applications. There are a few factors that need to be considered before you determine the quantity of batteries needed. First, consider the type of battery you intend to use with your application. Next, determine the size of the battery and the number of amp hours you require between charge cycles. Most people have at least a 400-450 amp-hour battery bank, but this depends on use of your system. All Inverter/Chargers must be installed in a dry, well-ventilated compartment. While most units are designed to withstand corrosion from the salty air, they are not splash proof. The units also require a fresh air supply to operate properly. What are the advantages & disadvantages of using an inverter/charger ? The obvious advantage is that everything is in one box and the purchase price will have been a lot less than a separate inverter and separate battery charger of the same quality, also they take up less space If you use heavy power tools or welders or such stuff you need not worry about plugging them into separate power points or switching over your generator via a switch. All this is done for you. Your inverter/charger could have onboard electronics to automate starting the generator (if your generator is suited to auto-start) and will be a highly reliable device saving space as well as money. 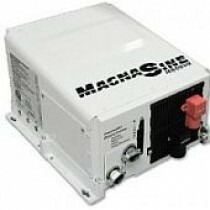 A good inverter/charger will have electronic sensing to determine generator load and will reduce battery charger output if your vessel demand on the generator is high. The disadvantages are: If you use anything but a high quality generator your power quality will suffer. The output from the average generator is way inferior to that of a modern inverter. Whether you want to or not, if you are battery charging with the charger part of your inverter/charger you are also using generator power from your generator in your house. If either the inverter or the battery charger side of the unit has a problem or failure the whole unit needs to be removed thus leaving the vessel without both a battery charger and inverter.